SketchUp is a great software for creating 3D or 2D geometry that can then be imported into analysis software (or used for analysis right in SketchUp). You already saw a few examples for this in my book: One is the building energy analysis setup with the OpenStudio plugin that I describe in chapter 4 in the book. Another one is the lighting analysis that you can do with some rendering software (LightUp is shown as one example in Chapter 5). What I want to go over here is how you can create a structural geometry model in SketchUp that you can then export to a structural analysis application. In my case, I am using VisualAnalysis because I use it for my teaching as well. This software is available for students as a free version and allows for importing DXF models. Of course, you can use the same method with other analysis software packages as well, just make sure you are able to import either DXF or DAE files that SketchUp can generate. The free version of SketchUp can be used to generate quite complex geometry. There is no need for an AutoCAD or Rhino installation here. 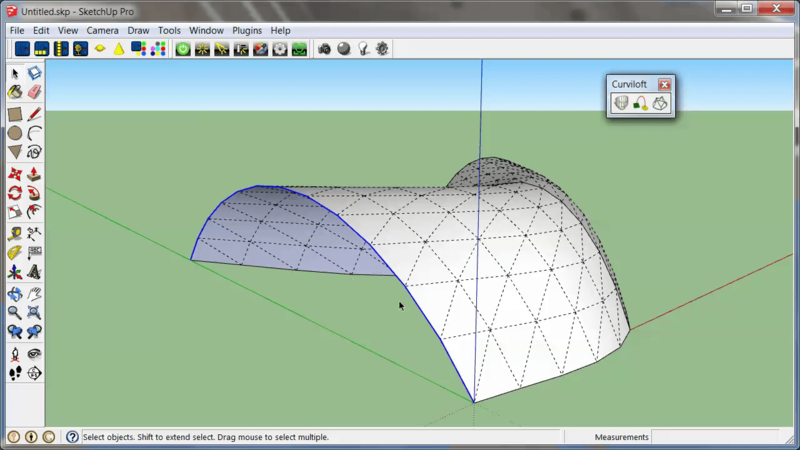 The many plugins available for SketchUp can help you create all kinds of geometry. For examples and tutorials, consult Chapter 4 in the book. SketchUp is a polygon modeler that also uses arc segments. Usually, structural analysis software is also only capable of analyzing straight beam elements and 2D planar elements. 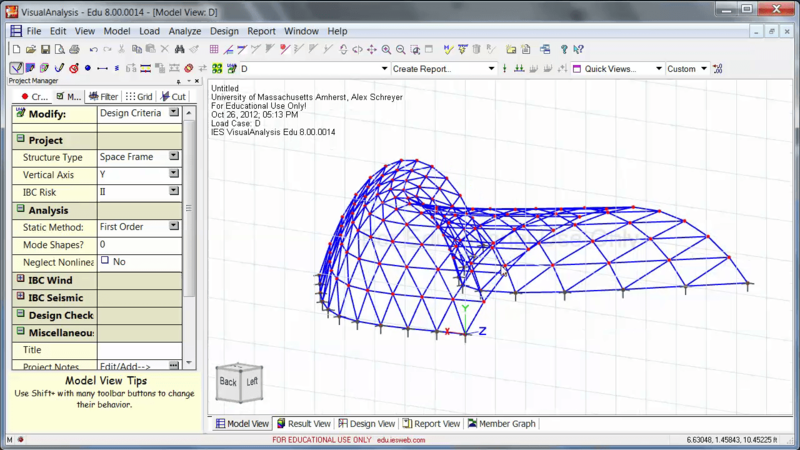 Curves in CAD software often need to be turned into a polyline in analysis software. This behavior is already built-in to SketchUp. The Pro version of SketchUp has DXF export, which is a reasonably good exchange format for lines and polygons. Even in the free version, plugins are available to provide this basic functionality. Many analysis software programs can import DXF and possibly other formats as well. Create your model with analysis in mind. For example, select the number of curve segments based on the number of elements and nodes you will need later. When you create a physical model (e.g. extruded tubes) in SketchUp, consider keeping the original axis lines around and put them on their own layer. You can the later use these as basis for this export. Depending on your structural material, you will want to either export (axis-)lines or faces. Make sure you select this in the exporter. When you import your model, watch the units. SketchUp likely exported everything in inches. You might also need to switch Y and Z on import (or rotate your structure afterwards). Set up your geometry as precisely as possible in SketchUp. Otherwise elements might not be connected where you want them to be.